It’s a new year, with fresh challenges and opportunities for small business employers. 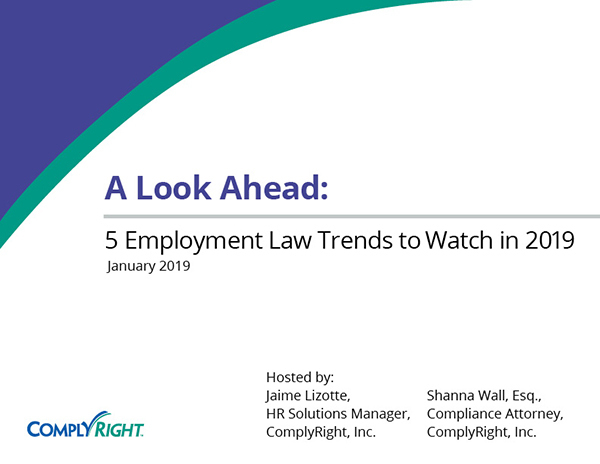 What are the key employment law developments most likely to influence your workplace in 2019? 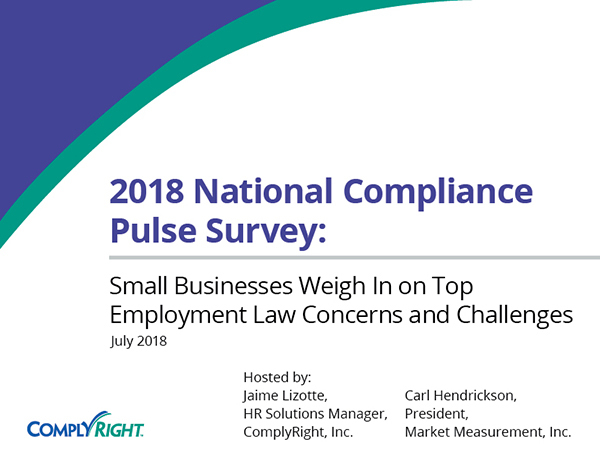 During our post-webinar Q&A session, Jaime Lizotte, HR Solutions Manager and Shanna Wall, Esq., Compliance Attorney, will answer questions on upcoming HR issues expected to heat up this year and how to keep your business compliant. What are the critical employee policies every business should have? At-Will Employment: This policy states the employment relationship can be terminated at any time, by either the employee or the employer, for any reason or no reason at all. Payroll: This would include things like the definitions of exempt and non-exempt employee classifications, as well as your pay period and paydays. It would also detail your overtime-authorization policy and any meal or rest break guidelines for hourly employees. Rules of Conduct: This policy can set expectations on everything from dress code and customer interaction to personal use of company equipment and social media. It basically lays out the ground rules for your workplace. Anti-Harassment: As mentioned in the presentation, this policy describes what constitutes harassment and your internal reporting procedure. There are a lot of other recommended policies, like a workplace drug policy. But these are a good start. An employee complained about an office happy hour where she said she saw some offensive behavior. Could she have a legal harassment complaint? It wasn’t a company event. Yes, it could be a legal harassment complaint. It doesn’t matter if it wasn’t an official company event. Harassment can occur in the office, after hours, on lunch breaks, at tradeshows or at happy hours. You need to conduct a full investigation immediately. Your question brings up an important point. A harassment claim doesn’t have to be made by the person at whom the conduct is directed or a member of the protected group targeted by the harassment. 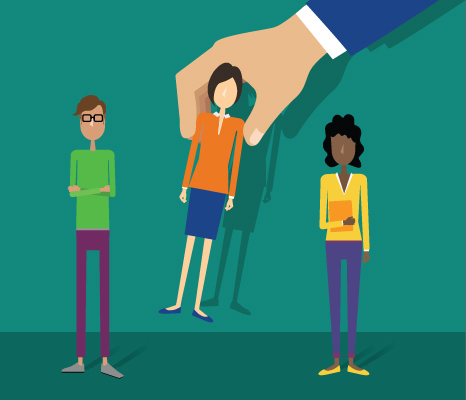 A harassment claim can be made by any employee offended by the conduct, including onlookers. Is it best to have your employee policies printed out or online? It really doesn’t matter as long as all employees have access to the policies. And you have some sort of acknowledgment of receipt. It’s important that you review and update your policies regularly. So you definitely want to have an electronic version so you can make updates. But it doesn’t matter if you distribute paper copies or send via email. Do any businesses really get fined for not displaying labor law posters? It happens. But it’s rare. There’s no poster police. It does sometimes happen during a government investigation, such as an OSHA investigation. But the bigger concern with not displaying the posters is an employee lawsuit. Courts have extended statutes of limitations because employers didn’t notify the employees of their rights and responsibilities by not posting the required notices. And not having posters can be considered a sign of bad faith. Employers are responsible for communicating their employees’ legal rights. 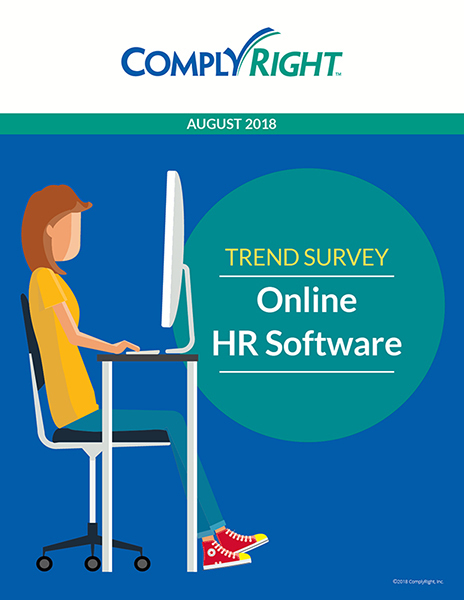 In Connecticut, are these 50 employees in the state or the whole company? My company has retail stores in multiple states and head office is operated from NY. It’s going to depend on how the law is written and which law you are specifically asking about in this question. Some laws will clearly say 50 or more employees in the state (such as Connecticut’s paid sick leave law) but most of the time they just say 50 or more employees. 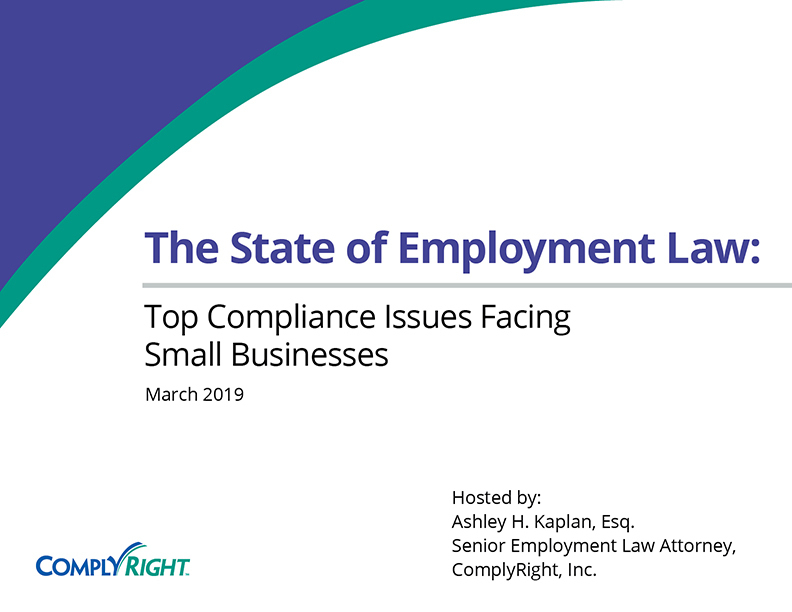 For Connecticut’s harassment training requirement, the law simply says, “an employer having fifty or more employees.” If you have doubt or when the law is ambiguous it is best to consult with a local employment law attorney. There could be a case that interpreted the law and give more guidance that the statute itself. In the cases where it is silent or ambiguous, is safer to err on the side of caution and presume it is 50 or more employees within the company in total. Especially in the case of harassment training and policy requirements, you should have these things in place regardless if it is a mandatory requirement anyway to be your first line of defense against harassment claims. If I have one employee in California, and 90 in Iowa do I still need to follow the California law? Again, it depends on which state law we are talking about here and how the laws are written. You should confirm with an employment law attorney whenever in doubt, but typically you have to follow the laws in place where your employees are located, even if it is just one worker – especially in California. This goes for remote workers too. If most of your employees are in your home office in one state but you have a remote worker in another state, you will generally have to follow the laws where the remote workers are as well. What if the employer has all of the notification on the intranet and not hand out physical paper? Each employee notification/handout has its own requirements. Sometimes providing the notification via an intranet may be sufficient. However, others specifically require the employer physically provide the notification to employee. Even sometimes, the requirement may be sent via certified mail or include it with a pay check. Unfortunately, there is not uniform requirement regarding how to provide the notifications. Where can I locate state-specific laws? There is no easy answer to this question. States generally have their laws (statutes and regulations) available somewhere online but it isn’t just one website for all 50 states unless you have access to a legal research resource like Westlaw or Lexis. When searching online though, be careful that you are finding the most up to date versions as laws do change from time to time.